Over the years as artists become established and gain a reliably supportive fan base their music tends to stick closely to precedent… if not follow a successful formula to the letter. This may not be a case of abandoning all creativity by merely imitating their earlier hits as closely as possible without committing copyright infringement, but generally speaking hitting upon a widely accepted sound will result in revisiting that sound until its appeal wears thin. The best artists however are too creatively restless to head down the same road for too long and usually when they do have a follow-up in a similar vein they manage to come up with a new twist on the idea to keep it fresh. But it stands to reason that as long as there’s hits to procure from giving the people want they’ve shown they want it would be foolishly naïve to think most artists would be contrarian enough to buck convention altogether if they wanted to remain an A-list star. Ivory Joe Hunter, for all of his well-documented artistic curiosity, was somebody who understood the necessities of trying to maintain a career in an ever-changing music field and so when something he’d done – and LIKED doing – connected with an audience… well, it was in his nature to try it again to see if he could do it even better. Obviously the entire premise of this website is to chronologically tell rock’s story as it evolved by looking at each record as they came out and to piece together the shifts in styles brought about by moments of inspiration as well as the commercial returns which validated it to artists and record companies. In doing so though we also get to chart the course of each individual artist as they try and carve out a niche for themselves in the crowded and competitive field, all hoping to find some aspect of what they do to both fit in with the larger movement but at the same time stand out among them so that they become the one outlet available for getting that fix. Ivory Joe Hunter has done both of those things about as well as could be done even though at times it seems as if he was bound and determined to cast himself adrift from the whole rock scene with some of his more restrained offerings. As regular readers well know Hunter’s specialty was ballads played with a light touch, accompaniment that skewed at times towards pop or jazz, or more recently of late even country music, and sung with a warm tone that was reflective and often curiously repressed as he reined in the stronger emotions clearly visible under the surface. What separated him from the pop crooners and kept him under the rock umbrella was a hint of soulfulness in his voice that couldn’t be scrubbed clean with over-enunciated vowels and an open-throated delivery meant to take the edge off. He also for the most part wasn’t singing of the blissful sentiments of (I Love You) For Sentimental Reasons as Nat “King” Cole had, or The Ink Spots To Each His Own, songs which substituted starry-eyed visions of a love for more realistic – and conflicted – emotional longing of the kind Hunter most often explored. Even when other black pop crooners like Billy Eckstine mined similar terrain as Hunter on something like A Cottage For Sale it was done with technical beauty but was absent any genuine feeling over the loss. He wasn’t living the words so much as reciting them in a detached performance because that seemed to be the limit to what pop audiences could endure during that era, especially coming from African-Americans whose true feelings those listeners couldn’t bother caring about to begin with. Hunter by contrast wrestled with the ache of these losses and that in turn placed him well within the rock field which valued emotional integrity every bit as much as the musical mayhem which garnered all the headlines. When looking back from the present the trajectory of Ivory Joe Hunter’s recording career may seem like merely variations on a theme, or on a sonic mood if you prefer, exploring songs which kept the tempo sedate, the outlook forlorn and the emotional undercurrent palpable, and on the surface that’s true enough. But there have also been distinct phases to this approach which have very clear beginnings, middles and ends and we’re now reaching the end of this particular one which spanned the last six months and has been his most successful commercial run to date. Call it his country-shaded period if you’re most interested in his musical leanings, or the yearning trilogy if you want to focus on the thematic similarities of these works, but Hunter’s last three hits – including this which would reach #2 on the Billboard charts – are cut from the same cloth, but also more importantly they come from the same artistic restlessness he was accused of not always possessing. 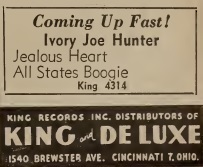 His early attempts on King Records were a hodgepodge of ideas that seemed unfinished, or at least unpolished, as they were rushed to get as many sides in the can as possible before the recording ban went into effect at the end of 1947. Once he had more time to work on his material without the pressure of having to cut it in a mad frenzy to beat a deadline his output improved. Gone were the throwaway lines that had likely been inserted as convenient placeholders and kept there when no quick alternative could be dredged up. In their place were well-crafted lyrics wherein each word was carefully planned for maximum emotional impact and to meet the necessary scansion as to how the line read. But what really stands out is how these three songs connect together, offering us not only a look into his mindset at the time which indicates he was teetering on the brink of a relationship that was still uncertain, at least in the first two sides which he himself wrote, but also his musical sensibilities which were exploring something very specific to convey these feelings. Waiting In Vain came first and effectively used a string section to heighten the tenuous nature of his situation of a man hoping the feelings he has for a girl aren’t going to be for naught. The violins added a melancholia to the song which seemed to suggest that he might lose out in the end even though the outcome was still in doubt. He must not have suffered that defeat in love after all – at least if we’re to read this as a progression of characters and story (by no means a sure thing in that day and age) – because when we next encounter him on a similar sounding record, Guess Who, the object of his affection is either with him or within reach, and the keening strings now take on a more contented aura, laying bare his desire in a restrained but unmistakable manner. In this setting we have no doubt he won her heart which would seem to mean the next step would be to recount the joy of finally being with his beloved. But no, on Jealous Heart it all falls apart and leave him alone, the victim of his own actions, a perfect surprise ending if we treat these songs as an ongoing drama as so many listeners of the day surely must have done. If there’s one record among this trio that is odd-fitting surely it’s this one. For starters, as mentioned, it wasn’t written by Ivory Joe Hunter himself, but was actually a song that had been a hit for others in the country field dating back to 1944 when its author, Jenny Lou Carson, scored with it first, then saw Tex Ritter notch an even bigger hit the same year. The reason for its sudden revival here by Hunter was that it had recently been done in the pop field by Al Morgan and so Hunter was rushed into the studio to cut his own version to compete with it, as at that time most big songs, at least until rock upended this practice in some ways, had distinctive hit versions for different fields. Hunter was the logical choice in black music to take a whack at the song because of his recent flirtation with country-tinged records. But what makes it unusual is that the country leanings he HAD shown so clearly on his previous two smashes, namely the violins, or fiddles as they’d be called if he was singing these songs at The Grand Ol’ Opry, were nowhere in sight. This almost certainly wasn’t done to distance it from other motifs, but rather because it was a session hastily conceived for when Hunter was in Cincinnati on August 10th. It was the only song he cut that day, then was rushed out with a two year old side, All States Boogie, to serve as the flip even though he’d just released a record as this was being laid down – the aforementioned Guess Who – which would also hit #2 on the charts. So clearly it wasn’t conceived as a continuation of either the theme or the musical approach he’d recently shown, and there are some differences which are plainly evident, but it would be impossible not to sense his recent musical fixation finding its way into this song. As a result, intended or not, Jealous Heart winds up serving as a natural coda to this brief period of music-making. Let’s start with the story which takes front and center on the record and places Hunter talking to himself about his penchant for suspicion, distrust and envy now that he finally got the girl of his dreams. Like most guys plagued with insecurity they’ll find the biggest threat to their happiness isn’t somebody else stealing their girl’s heart away from them, but rather their own overestimation of the mere threat of that happening. Wracked with a deep-seated belief in their own inadequacies they take increasingly drastic steps to prevent their partner from even having the opportunity to interact with other men, feeling that by shutting them off from the world they’ll be able to forcibly keep the girl to themselves. But of course this mindset comes from a position of weakness and to compensate for that insecurity they become increasingly controlling, accusatory and abusive, whether physically or just mentally and emotionally, hoping this show of power convinces her of his strength and dominance over other potential rivals for her affections. The results are never pretty. The girl, if she can summon the strength to break free of his grip, will ultimately leave him, not because someone else offered her a better option, but because the one she was with offered her no options BUT to leave. In other words, the more extreme measures you take to try and mask your own weaknesses the more those weaknesses become apparent. Now Hunter doesn’t come across as the stereotypical boyfriend whose made a science out of applying pressure on her in various ways to make her uncomfortable to be around other people for fear of him overreacting, thus fulfilling his desire to have her seek to avoid that by spending all of her time with him and him alone. Instead Ivory Joe seems to be the kind who let this insecurity eat him up inside and rather than seek to exert control over her to get her to stay, probably went the other route which was to act excessively needy and weak, hoping that would elicit enough sympathy to keep her with him. Obviously it did not for which we can only say to the girl in question – good move for leaving him, what took you so long? Musically this fits the bill for a song with that perspective as the trumpet and alto sax are entrusted with carrying the rather light load, making sure the atmosphere is as bleak and mournful as possible without shorting out the microphones with their sobbing. Since Henry Glover, a trumpeter himself, was overseeing this session it’s not surprising he’d lean on the instruments he was most comfortable with, but by taking away the strings that Hunter was experimenting quite successfully with recently it makes Jealous Heart the perfect ending to this stage of his career, a transition piece rather than a revival of the exact same concept in the exact same setting as what he’d been featuring as of late. Because the song WAS a country tune originally it can’t help but have that lilting feel that was embedded in its DNA, thereby keeping it close in spirit to what preceded it in his catalog. Yet by re-framing it in a more urban nightclub-esque setting it pulls Hunter further away from the direction he was naturally headed before this. The two sources pull at one another without falling into conflict, maybe a testament to Hunter himself who handles the vocals with sensitivity that never lets it descend completely into self-pity. Or perhaps it only goes to show that all types of music, whatever their origins, is closer in theory than stylistic partisans make it out to be. In the final analysis though this seems to have set Hunter off in a different direction musically, one that would – maybe not surprisingly – coincide with him leaving King Records for the aspiring major label MGM after his two year contract came to a close next month. He’ll quickly embark on a new route which will consolidate what he’s perfected as of late, but do so in a different manner that marks a clear separation from this type of approach. Just as with personal relationships you can’t keep someone you love under wraps, for all caged birds still want to fly, in music a creative artist can’t be artificially pressed into constantly reviving the same styled songs without feeling constrained. Maybe all it took for Hunter to see a new vista on the horizon was to have somebody open the window for him. 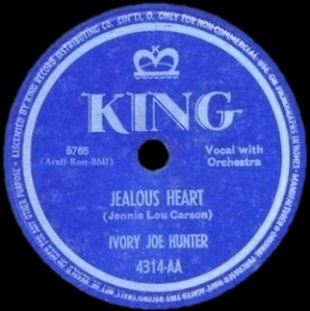 Leave a reply on "Ivory Joe Hunter: “Jealous Heart”"